A Goulburn abattoir has teamed up with a Queensland energy provider to turn its waste into energy, thanks to funding from the Australian Renewable Energy Agency (ARENA). 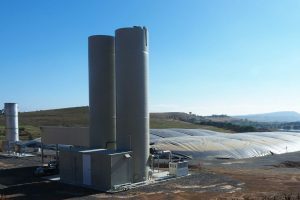 On behalf of the Australian Government, ARENA last year provided $2.1 million in funding to ReNu Energy to design, construct, own and operate a biogas facility at Southern Meats’ existing abattoir facility. The Goulburn abattoir processes sheep and lambs, using around 20,000 KWh of electricity every day. The lagoon acts like a giant bladder that can expand to hold biogas when energy demand is low, saving it to generate power when demand hits a peak. Simultaneously, this system disposes of waste from the abattoir and reduces methane emissions. Biogas is treated and transferred to two 800 kW dual fuel generators to produce approximately 3800 MWh of electricity per year for use during the manufacturing process to reduce peak electricity consumption. ARENA CEO Ivor Frischknecht said bioenergy represents a significant opportunity for the livestock processing sector to switch to renewable generation and reducing exposure to energy prices. “Bioenergy also has environmental benefits for being able to re-use the effluent rather than disposing of the waste,” he said. ReNu Energy CEO Craig Ricato said: “This project is a fantastic example of waste to energy generation, and we are very pleased to have the opportunity to work with an excellent counterparty such as Southern Meats. We also thank ARENA for its contribution to the project. ARENA plays an extremely important role in assisting companies to demonstrate and commercialise renewable technologies such as anaerobic digestion. “ReNu Energy sees great potential in the Australian bioenergy market, in both the agribusiness, food processing and municipal waste sectors. We look forward to continuing to apply the knowledge and IP that we have in the construction and operation of anaerobic digestion projects, as we grow our portfolio over the coming years,” he said.